Description: 66K or H8E rolls through CP Park with quite an engine consist. While chasing this, I thought the engines would be a pair of C40-9Ws! Description: Heading back home to Croxton. Home sweet..... oh wait. Description: A New Jersey Transit MU set passes the NS H90 after cutting away from the Ringling Brothers and Barnum & Bailey Circus train. Description: Prior to leaving Croxton Yard, NS 8351 was added to the train for additional horsepower. Description: After Amtrak has pulled the circus train away, the HC90 heads back to Croxton Yard. The NS 8-40CW is a rare site on this part of the NEC. 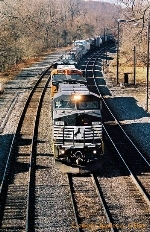 Description: A Conrail unit leads a triple lashup of locomotives leading a coal train northbound. Description: Struggling to make the top of the grade which is just around the corner. Description: NS #20K eastbound @ 11:07 Hrs. Description: PRR 8324 (ex-CR 6068) and NS 8351 (ex-CR 6112) head up this train of TOFCs. Description: #64-J east @ 09:53 hrs. Description: A Conrail Dash 8 leads an empty trash train east. Description: Westbound doublestacks passing through CP Cannon. Description: ex-CR now repainted to NS colors. Description: EB autoracks behind ex Conrail C40 by the signals through the work in progress CP Bound Brook. Description: An Ex-Con leads NS train 275 Southward. Taken with my brand new 70-300 Canon w/ IS tele lens.